Valley Fortress is the final fortress the player has to face in Super Mario World. It can be accessed through a secret path from Valley of Bowser 2. It includes Skewers as major obstacles (these often require precise timing to get through), and the enemies Lava Bubble, Dry Bones, and Bony Beetle. The boss fight is with Reznor, which is like any other fortress in the game. Beating this allows the player to gain access to Back Door. Like in all other Castles and Fortresses, the player starts off with a cutscene of the door opening into the fort. The player is inside the fortress now. They can see the Skewers, slamming in to the ground and rising up. The player can see a Green ! Block, which contains a Cape Feather. More Skewers can be seen, and now the player can see Spikes on the wall and the wall underneath it as well. Now the player faces a couple of Dry Bones, a Bony Beetle, and some Falling Spikes. More spikes and Skewers that slam into the ground can be seen. 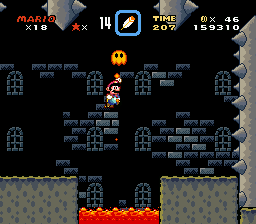 After the player passes this area, they see lava, along with a ledge which has a Dry Bones along with a Yellow ! Block, which contains a Super Mushroom. Lava Bubbles pop out of the lava occasionally, so the player should advance cautiously. Another ledge with a Dry Bones, and another one with a Bony Beetle are seen. The player reaches a ledge mounted on the ground, and see Skewers, which move faster than before. The player must avoid them, while also jumping carefully along the pits of lavas filled with Lava Bubbles. The player sees one last Skewer, which goes up instead of slamming down. The player sees the Boss Door, and has to fight the Reznors. After the player defeats them, they gain access to Back Door. This page was last edited on April 9, 2019, at 03:02.